Lloyds Banking Group is cutting about 1,660 jobs after deciding to close all Cheltenham & Gloucester branches and overhauling its loan and mortgage arms. 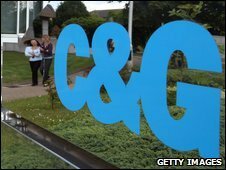 C&G will disappear from the High Street from November, but the brand will be kept for mortgages and savings. Lloyds said C&G customers would be able to use Lloyds TSB branches. It added that the job losses were "regrettable". Almost 3,000 jobs have already been cut since Lloyds' merger with Halifax Bank of Scotland (HBOS). Bad debts at HBOS mean the group faces an annual loss. The closure of all 164 C&G branches will see 833 full-time jobs go. Lloyds said it was closing the Chester office of the personal loans business, and moving operations to London, with 265 full-time jobs lost. Meanwhile trimming the number of its Black Horse personal finance centres and moving its car financing arm, CarSelect, from Cardiff to Birmingham will result in the loss of 140 jobs by October. And 159 jobs will be cut among those selling its mortgages - with home loans no longer available from Bank of Scotland and Intelligent Finance from 1 July. BBC business editor Robert Peston said that the announcement was "profoundly bad news" for many employees of Lloyds, saying that the group's financial predicament meant further job cuts were possible. 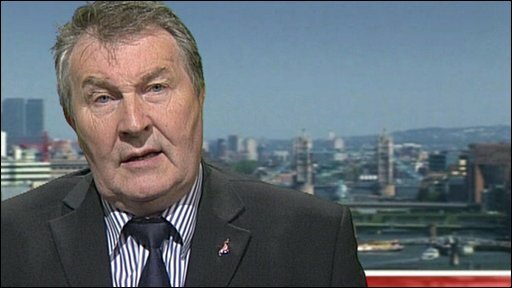 Union officials have complained about "death by a thousand cuts", urging the bank to "come clean" about the scale of the restructuring programme. John McFall, head of parliament's Treasury Select Committee, said that he was disappointed that Lloyds staff found out about the job losses from the media rather than from management. "This would be undesirable in any firm. It is unacceptable in a firm partially owned by the taxpayer," he said in a letter to Eric Daniels, Lloyds' chief executive. The closure of C&G branches follows an announcement from Santander last week, that it is to rebrand Abbey, Bradford & Bingley and Alliance & Leicester. "It's not an insignificant change for the UK High Street. Some of the most famous names in retail banking are disappearing," said our business editor. A Lloyds spokesman said that C&G was an important brand to the group and "would continue to be so". Those with a C&G mortgage will continue to have their home loan under that brand - with new customers still being taken on via mortgage brokers. C&G has been a significant player in the UK mortgage market, offering some of the lowest standard variable rates, said BBC personal finance reporter Kevin Peachey. The most recent data available showed that Lloyds - through C&G - had an 8.4% share of the UK mortgage market by the end of 2007. Andrew Montlake, of independent mortgage broker Coreco, said the loss of the brand on the High Street was "an inevitable consequence of brutal market conditions". "For borrowers, this is a real blow to competition and consumer choice," he added.